Australia's Most Awarded Mercedes-Benz Retailer proudly presents this Certified low kilometre A200. 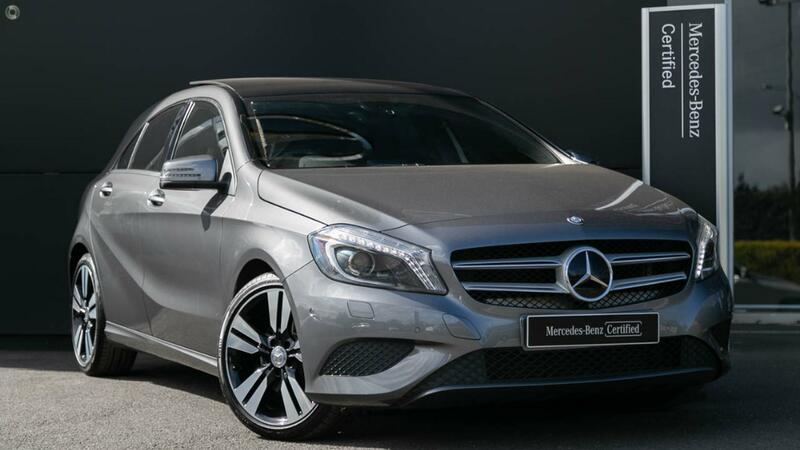 Very well specified equipped and perfectly presented in sparkling Mountain Grey Metallic over Black Larochette Fabric and ARTICO Trim with Vision Package featuring Panoramic Glass Electric Sunroof and COMAND GPS Satellite Navigation Package including LINGUATRONIC voice control operation and Harman Kardon Logic 7 surround sound system, all with the assurance of 2 Years 100% Mercedes-Benz Factory-Backed Warranty & 2 Years Mercedes-Benz Roadside Assistance Applicable Australia-Wide. Take the wheel of your immensely safe and fantastically frugal A200 with absolute confidence - ONLY from a Certified Mercedes-Benz expert and the reigning "Mercedes-Benz Metropolitan Retailer of the Year" again, for the 5th time in 6 years! - Panoramic Glass electric sunroof.